What challenges do hybrid orgs face? It’s probably clear by now that I’m a keener for orgs mashup public benefit mission + market disruption + the participatory nature of the web. Mozilla is one such organization and, as I look around, I see others. There is alot of up side to how these orgs work, especially the potential to move markets towards the public good at a global scale. But there are also a ton of very real challenges in making these orgs work. That’s what I want to write about today. From where I sit, the biggest challenge is explaining ourselves. The hybrids that I am talking about tend to have both missions and org models that people haven’t seen before. As shaver said to me in a tweet, this means we ‘…have to use 500 words to explain what we do, vs. five words for a pure for-profit or non-profit play.’ Fixing this is no small task, and it quickly cascades out into other problems. Think about this in the Mozilla context for a moment. First off, we need to explain that we exist to promote and protect the open nature of the internet. While this mission fits well within the centuries old tradition of public benefit organizations, it’s not easy to point to similar examples that help people immediately understand what kind of beast we are. Red Cross? Sierra Club? Public radio? There are overlaps with all of these, but none provide a perfect parallel. The result: a whole bunch of long winded explaining. Even if the mission comes across, there is still the organizational model to communicate. This matters less at first blush. Who but the taxman really cares whether an org looks like a company, a charity or a little bit of both? It turns out that many people do. As I travel around talking to people about Mozilla, I am finding that everyone loves Firefox (no surprise) but almost noone knows it’s made by a global community of volunteer contributors backed by a public benefit org (this has surprised me). When I explain a bit, I get happy surprises. Things like “wow, that makes Firefox even cooler’ and ‘I didn’t know I could get involved’. Once people get Mozilla’s model, it excites them. However, the lack of a shorthand way of explaining all that is bundled up in ‘hybrid org’ means it takes a bunch of explaining to get to that point of excitement. This challenge of explaining ourselves is what lilly might call a ‘big poetry problem‘. 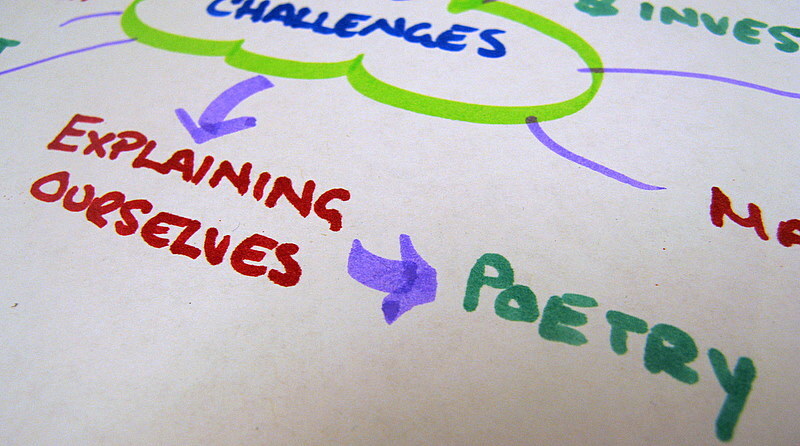 Getting the poetry right is an essential element of success. However, hybrid orgs also face a ton of significant challenges on the pragmatic front. Decision making. Structure. Engagement. Investment. Staff recruiting. Management. Participation. Product. Public relations. Organizing resources. Revenue. Leadership. It’s not that other orgs don’t face challenges in these areas. However, the nature of these problems is often quite different when you’re working with a hybrid model. 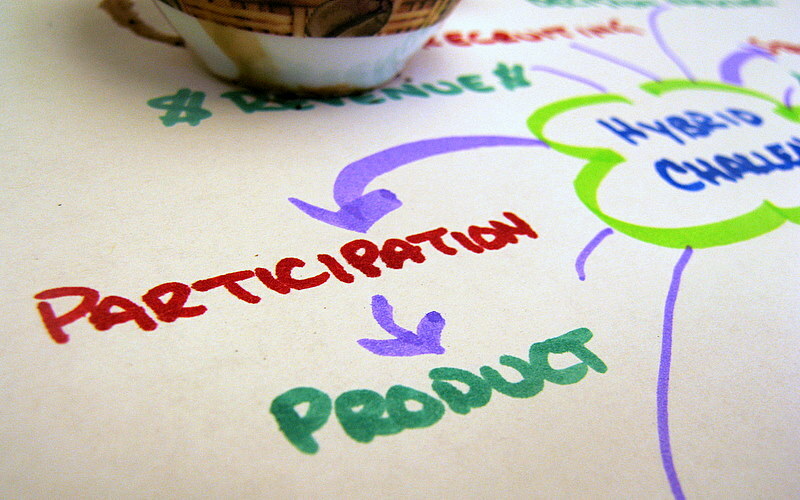 Take the intersection between ‘participation’ and ‘product’ as one example. Many non-profits are focused on public participation. These orgs use well honed engagement and facilitation techniques to get people out, harnessing community effort to raise important issues, clean up parks and so on. However, until recently, this kind of mass participation was rarely used to make specific, high quality products (or services) that need to ship at a specific time and succeed in the market. Until recently, creating products and services that will be used by large numbers of people has been the domain of big companies and governments who can marshal trained specialists and set up big management structures. Organizations like Mozilla turn this upside down and sideways. They combine the mass participation of social movements with the ability to create high quality, desirable (public) goods that people will use every day. This is where the challenge comes in: we don’t have well established models managing, facilitating and leading in this kind of environment. Hybrid orgs are inventing these models, finding ways to create good goals and scaffolding, focus on participation, let people scratch their own itch. The thing is, there is no clear roadmap on how to do this and the daily pragmatics are hard. There is a need for constant reflection, tweaking and a kind of personal + collective honesty that’s hard to come by. ‘Structure‘ is another good issue to look at from a hybrid org perspective. We have well established legal structures for create non-profit, public benefit organizations. Yet, in every country that I know about, these structures work poorly when people try to hybridize and innovate what it means to do public benefit work. They have trouble keeping up with new and emerging public benefit roles in society (example -> Wikipedia providing universal access to all human knowledge). They aren’t well tuned for organizations that participate in the market with a public purpose (example -> Firefox pushing open standards back into the mainstream of web development). And they don’t account for the critical role that volunteer contributors play as a form of public support and participation (example -> Mozilla localizations). The frameworks we’ve developed for charities over the last few hundred years just haven’t caught up to these new ideas yet. The result is that many hybrid organizations must engage in pretzel like contortions in order to find a structure that works. In Mozilla’s case, we’ve set up a charitable foundation as well as a number of wholly owned commercial subsidiaries. All of these organizations share the same mission of promoting the open nature of the internet. All of them engage with community members to create products and services that advance this mission. And all all of them can demonstrate huge public support and participation. Yet, we run them as separate organizations. In some ways, this isn’t the end of the world, and it certainly seems like the safest option given the ambiguities of charity law. But there is no question this pretzel like structure adds strategic and operational overhead, and can just plain confuse people. There are definitely days where I wish we could just be one public benefit organization called ‘Mozilla’. Of course, ‘participation’ and ‘structure’ are only two examples of pragmatic challenges that hybrids face. You could also dig into the question of investment, and in particular the fact the hybrids are percieved as a bad fit for both private investors and traditional grantmakers. This makes it tough to scale, compete and move the market. Or you could explore the revenue side. Hybrids must constantly ask: what kinds of income are going to align with — or at least not disrupt — our public benefit mission? Leadership — and how you balance it with distributed decision making and the culture of the web — also seems pretty central. The list of questions and challenges is pretty long. My goal here is not to go deep on every major challenge, but to set the tone and get others talking. 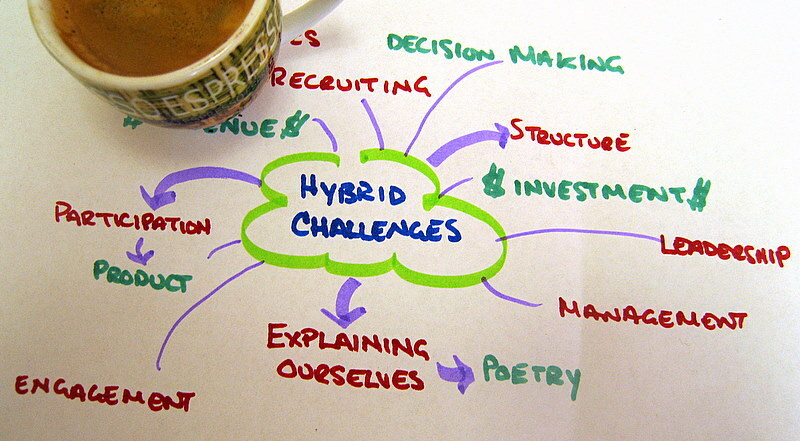 What do you see as the biggest challenges that hybrid orgs face? And do you know of hybrid orgs that have overcome these challenges? I’d love to see responses to these questions as comments and trackbacks. Also, we’re planning to talk about these questions with a few organizations that feel similar to Mozilla at a small gathering next month. My hope is that simply mapping the challenges and looking at how people have tackled them will go a long way towards helping us make our hybrid organizations better. Once we’ve done a bit more of this, I promise to loop back and synthesize what people are saying. Should be interesting. Why do hybrid orgs matter? I’ve been poking at the question ‘why do hybrid orgs matter?’ for a couple of days now. Emailing friends and colleagues. Grilling people over dinner. Drawing little doodles. As I did this, I kept stumbling around ideas like ‘huge impact’ and ‘creating public goods’ and ‘massive participation’. Important ideas, but not quite what I was hoping for. It turns out that coming up with a crisp, helpful ‘why hybrids matter’ statement is tough. It’s tough because the ideas we’re playing with here are (in part) very new, and the term ‘hybrid organization’ is still quite fuzzy (there are many different takes on hybrids beyond what I am talking about). However, the more I dig, the more I am convinced that organizations like Mozilla, Wikipedia, Kiva, Miro and so on that mashup mission, market and the culture of the web represent a new pattern worth understanding. Even if we don’t yet have the right words to describe this pattern yet, we need to dive in, think and play. Mission + market + web hybrids matter because they can wield the power needed to move markets at a global scale, while still looking out for the small guy, taking the long view and staying true to their public benefit mission. They show us how organizations could — and maybe should — work in the future. It’s pretty awkward and wordy, and in a number of ways not quite right. That’s okay. Even more than earlier, my hope here is to spark conversation. Why do mission + market + web hybrids matter to you? What would you add to this statement? This one comes from something johnolilly said in email: “Sometimes we need organizations with financial and market strength but mission-orientations to keep capital-only-organizations doing the right things for the commons. Historically, those with money, and money-missions, have had all the power. Hybrids are important because they have the potential to let mission-oriented orgs wield similar power, but for human-oriented needs.” No question this is at the core of what matters. tonyasurman agreed but pushed one step further: “What’s unique about hybrids is the ability to take move market but also the ability to do this at a global scale without losing the integrity of the small. This is really important. Non-profits and social enterprises have never had the potential for this kind of impact. Hybrids can take public benefit products and services to a scale never before imagined.” The global scale that comes w/ the web also seems critical, and not just on the market transformation side. It’s an essential part of creating high quality products and services using peer production. 5. …. and staying true to their public benefit mission. Responding to my first post, stephendeberry asked: “how do you ensure the public benefit remains core to the hybrid model?” This is actually a huge challenge for both traditional non-profits (grantmaker demands trigger mission drift) and social enterprises (can become more about the market than the mission). And it’s somewhere I think hybrids built on the idea of mass participation and peer production have a special advantage. They not only have boards and leaders committed to the mission, but they also have huge communities actively involved in interpreting the mission every day by helping to make something. The aggregate decisions of people who contribute to Firefox, or Wikipedia, or Kiva help shape what these things are in very real ways, which is in turn likely to make sure things stay more or less on mission. This isn’t to say peer production is democracy. Usually, meritocracy is the rule. Still, having a massive number of stakeholders involved in building things helps hybrid orgs stay public benefit focused. 6. Hybrids can show us how organizations could — and maybe should — work. The organizational tools available to us as a society are quite broken, or at least don’t fit all the things we need and want to do. The current economic crisis shows this. The overly bureaucratized world of grant dependent non-profits shows us this. And, on a more positive side, the growth of massive informal social movements shows this. We don’t have good organizational models (or legal incorporation structures) to figure out how to channel the energy of huge numbers of people who want to play across mission and market make things better in a coherent, collaborative, high-impact and sustainable way. The hybrids I am talking about are taking a shot at fixing this, inventing and evolving new ways to organize as they go. This is pretty meta, I know. But it’s also pretty important. I think there is some good stuff in here. But it definitely isn’t completely right yet. So, the question now is: what’s the seventh item on this list? The eighth? And the ninth? I really want people to add to this list, to poke at it further and to call out the bits that feel like just plain bull. The more I struggle with these ideas, the more I think conversation is useful. Why? Because figuring out why these organizations matter, what makes them tick and what challenges they face (my next post) is a part of making them work better. Working in uncharted waters is hard. Sharing what we’re learning along the way helps. It helps those of us trying to nurture organizations and communities that mix mission, market and the web. And it provides fuel and encouragement to people who want to set up such organizations anew. Hybrid orgs. What’s old? What’s new? It’s been fun reading reactions to my first post on hybrid organizations. The conversation so far has underlined one very critical point: we are talking about something that is at once very old and very new. While I hinted at this last time, it feels like its worth digging deeper on which bits are old and which bits are new. The idea of people organizing for the public benefit is almost as old as the hills. England started calling these organizations charities and created a law to support them around 1600. Before that, maybe people just called it ‘community’, or took for granted that we should get together to help each other out? Whatever we call it, this impulse to make things better — and to organize around it — runs deep. It is not new. What is new is the toolbox that hybrid organizations draw from. Cheap global networks. A willingness to use markets as a channel to drive change. Collaborative peer production. Combined with the 500 year tradition of public benefit organizations, these new tools make it possible to organize huge numbers of people to create massively scaled, tangible public goods that out-compete what’s broken and make things better on a global scale. For me, it’s this mix that makes hybrids interesting. 1. Championing important ideas. 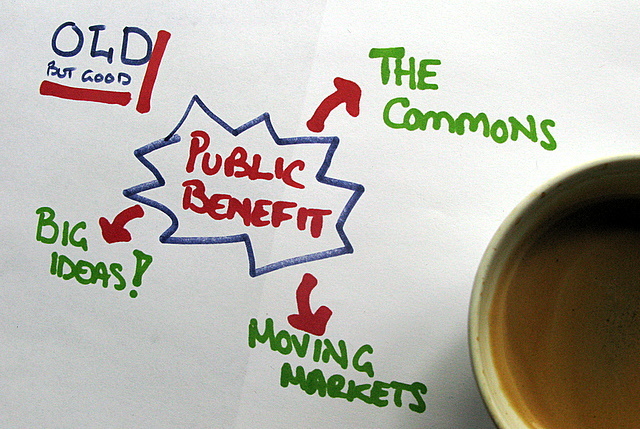 One of the first things we think of when we hear ‘public benefit organization’ is championing a big, important idea. History is filled with examples of organizations gathering millions to do everything from claiming their civil rights to protecting our planet to toppling colonial governments. The public benefit organizations behind such movements have not just been important, they have in many cases been transformative. When successful, they have changed the thinking of not only governments and businesses but whole societies for the better. 2. Protecting the commons. The idea of building and protecting things we hold in common like ‘bridges, seabanks and highways‘ has been recognized as a public benefit right from the outset of charity law. And of course, organizing people — and money — to protect the commons remains a major role for public benefit organizations today. Just think of libraries. Or the neighbourhood watch. Or organizations that protect forests and wildlands. These common assets are not just ‘nice to haves’. They are essential ingredients in a rich, healthy society. They make it easier to learn, keep us safe and clean the air. And, in the end, they even make it easier to do business. Organizations that protect common public goods play an essential role in our world. 3. Making markets wiser and more humane. Companies and markets don’t always do the right thing. In the last 50+ years, we’ve seen an increasing number of organizations that have tried to ‘move the market’ in ways that make it wiser and more humane. Organizations like the Forestry Stewardship Council, which has become the gold seal for planet friendly wood products, have shown that creating incentive for market players to improve their behaviour can make the world better for everyone. Many other organizations try to move markets in similar ways, using everything from humour to boycotts. The goal is not to be the market, but to make it easier for markets to feed, strengthen and respect the rest of what makes the world tick. All three of these public benefit roles and traditions are important. But pursing these roles using the traditional organizing models of the not-for-profit sector has significant limitations and challenges. Turning big ideas and mass movements into concrete change is hard, and a bit of a crap shoot. Scaling the commons and out-competing enclosure requires — or at least has required — huge resources. Finding enough strength and influence to truly move markets has proven tough for players who are not in the market themselves. For these reasons, public benefit organizations often struggle to have the impact they want to have, or accept that their impact will be small and local. a. Cheap networks, global scale. Clay Shirky has made it trite to say that the cost of organizing has gone through the floor. The thing is: he’s right, and it’s important. Cheap networks have made it possible for a very small group of people to organize effectively on a global scale. This is especially important for public benefit organizations which have typically had limited impact just because they couldn’t afford to reach out far and wide. The networked world makes it possible — in some cases even easy — to champion big ideas, build the commons and move markets on a global scale. This is genuinely new. b. Mixing mission and market tactics. The idea of mixing tactics from the mission (volunteerism, calls to action, donations) and market (products, competition, earned revenue) worlds is also fairly new. Social enterprises that develop products and services as a way to pursue their mission have really only been around since the 1980s. Organizations like Mozilla and Kiva that try to keep markets doing the right things for the commons on a massive scale are even newer. Despite this newness, the idea that mixing mission and market is a legit public benefit strategy is seeping into the public (and more slowly government) consciousness. c. Collaborative peer production. In the past, it the public goods created by non-profits and charities were by there very nature small and local. Collaborative peer production — the idea that many people on the internet can pitch in a small amount of effort to make something big — has changed that dramatically. A top quality, standards-based web browser. A massive, high quality encyclopedia. A huge alternative financing pool for poor entrepreneurs. No — or certainly few — public benefit orgs could have created such things 25 years ago. Peer production and open source changed this. The result: there are now organizations that can create public goods of a quality and scale that can directly move markets in ways that benefit the commons. These organizations don’t just describe big new ideas. Using the power of mass contribution, they make them real. 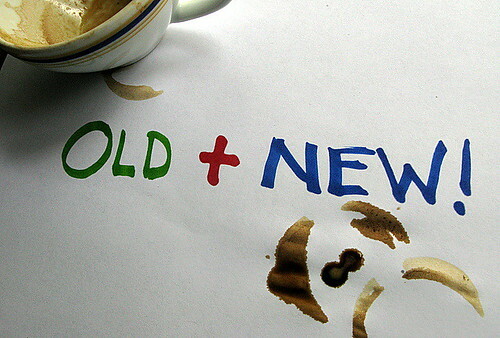 It’s the mashup of all these old and new elements that is the hallmark of the hybrid organizations I am talking about. Mozilla protecting the Internet commons by engaging millions of people to move the market. Wikipedia organizing people to create tremendous public asset that gathers the sum of all human knowledge. Kiva building a collaborative bank to move the finance market for the poor. These organizations are mixing the old and the new. They are in the public benefit remix business, figuring out how to get beyond the limitations of the past. From where I sit, that’s exciting, and important. 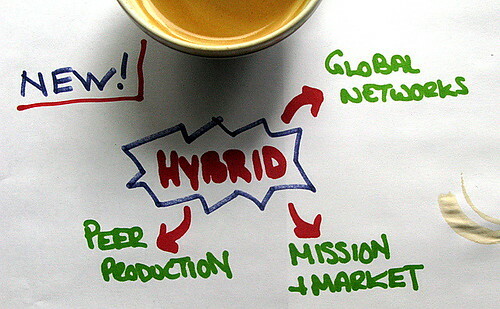 In my next post, I want to dig deeper into the question of ‘why do hybrid orgs matter’? The fact that we are seeing innovative public benefit organizations mash up the old and the new is cool. But what specifically does it get us? After that, I want to loop back to the challenges faced by public benefit orgs and look at the Mozilla case in a bit more detail. In the meantime, please comment, post and trackback to keep this hybrid org conversation rolling. What is a hybrid organization? When I first met Mitchell last year, she talked alot about Mozilla as a hybrid organization. I didn’t know exactly what she meant. But it felt right. Personally, I’ve been mashing up mission-based orgs, products, services, philanthropy and the web for well over a decade. It’s what I love most, and something the world needs alot more of. It is also one of the most powerful forces that drew me to Mozilla. Over the last six months, I’ve found ‘hybrid org’ rolling off my tongue more and more. It’s as good a moniker as any for the organizational mashup that is Mozilla (and Miro, and Kiva, and so on). But every time the hybrid term drops, it begs (or I get asked) the question: hybrid of what? I figured the time has come to push on this question a little with a series of posts about hybrid orgs and why they matter. This is the first one. So, what is a hybrid org? In the case of Mozilla — and an increasing number of other orgs — it’s a mix of social mission, disruptive market strategies and web-like scale and collaboration. Or, at least, that’s the definition I see emerging. If we take ‘social mission’ as the first element, then a hybrid organization looks alot like a traditional charity or not-for-profit. Public benefit is the core reason that these organizations exist. 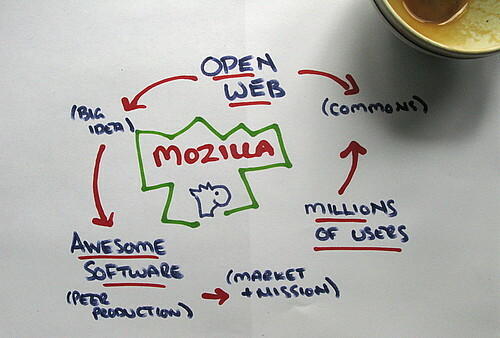 For Mozilla, the mission is to promote and protect the open nature of the internet. This means ensuring that the internet remains a public commons where anyone can innovate, experiment or express themselves without asking for somebody else’s permission. On our increasingly digital planet, we clearly need public benefit organizations that care about such things. When we move on to ‘disruptive market strategies’ hybrid orgs start to look a little different. These organizations use products, services and consumer choice to promote the ideas and move the issues that they believe in. Think about this in the context of Mozilla’s mission: the internet is shaped far more by the choices of people who build and use it than by regulation or high minded ideals. By creating products that a) many millions of internet users love and b) have open standards, security and innovation from the edge baked into their core, Mozilla leverages consumer choice to make the internet more open. With Firefox, this approach not only shifted the browser landscape from near monopoly into a more diverse ecosystem but also helped build the foundations for an era of standards-based web applications. Mozilla jumped into the market with a great product not to make money, but as a way to grow and protect the internet as public commons. Of course, there are thousands of organizations that use the market and consumer choice to pursue their mission. Social enterprises like Jamie Oliver’s 15. Market-standards organizations like the Forest Stewardship Council. And, in some ways, even traditional charities like Goodwill. All advance their cause (and sometimes to sustain themselves) through the market in one way or another. The thing that makes these hybrid orgs unique is mixing mission and market with the scale and collaborative nature of the web. The culture and technology of the web make it possible to grow a global community of passionate people who can pitch in to build stuff. The things they can — and want to — build are often quite complex: software that makes the web more open; an encyclopedia that offers free access to knowledge; a system of cheaper and better credit for the poor. With the web and collaboration, they can not only build these things, but they also have the potential for impact at a scale that only governments or huge corporations could have imagined in the past. From the programmers who contribute code to the localizers who make Firefox available in 70+ languages to the thousands of people who funded the first Firefox ad in the New York Times, Mozilla is filled with examples of web scale and collaboration. Does this mix of mission, market and the collaborative nature of the web really represent a new kind of organization? Some days, I wonder about this. But there is no question that there are an increasing number of organizations that combine these elements. Mozilla. Kiva. Participatory Culture Foundation. Donors Choose. Wikipedia. All of these organizations are trying to ‘move the market’ on the web in a way that both engages and benefits a broad public. As they do so, they are charting new territory. Over the next couple of weeks, I want to ask a few questions about this new territory. Why do these hybrid organizations matter? What challenges do they face? And what role does optimism and the desire to create play in hybrid orgs? I’d love to get people’s comments, blogs or tweets about these questions, and will definitely be posting more myself. Hopefully, there is an interesting conversation in all of this. You are currently browsing the hybrid category at commonspace.